Ready to see one of the most raucous, irreverent, heartfelt and side-splittingly funny musicals of the last 20 years? 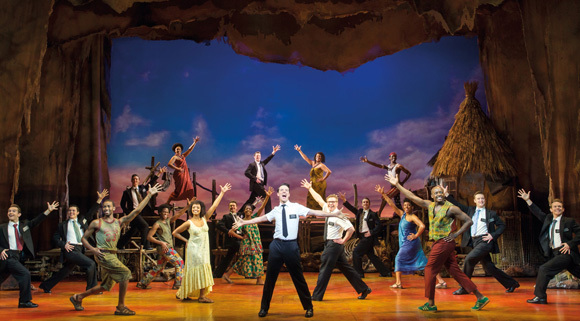 From the creators of South Park, Avenue Q and Frozen, Paramount Theater Seattle brings you the Book of Mormon – a journey with two Mormon missionaries into the heart of Uganda on their quest to convert the locals, with somewhat limited success. Receiving rave reviews everywhere it plays, the book of Mormon will make you smile, laugh, and maybe even cry. Choose your show below and buy your tickets today! After nearly 7 years methodic research and development, Trey Parker and Matt Stone, creators of South Park, together with Robert Lopez, the musical mastermind behind Avenue Q, premiered the show on Broadway in 2011. 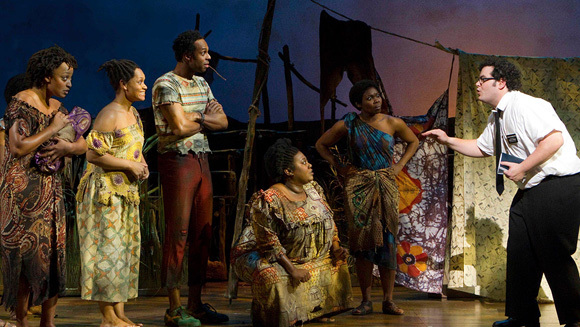 The show was a smash hit with audiences and critics, breaking records in ticket sales, nominated for and winning a whopping NINE Tony Awards including Best Musical, as well as the Grammy Award for Best Musical Theater Album. The original Broadway recording album reached the third position on the Billboard charts, making it the highest-charting Broadway album in over 40 years. The production was so successful, in fact, that despite making fun of Mormons, some have actually attempted to use the publicity gathered by the musical to initiate new followers into the religion! Experts in satire, Stone and Parker have fully embraced the musical theatre genre – with over-the-top dance numbers, colorful, extravagant sets, and of course fantastic, catchy songs – but blended the classic formula with their own brand of playful, provocative humor. Despite the show’s potential to offend, it is a story with heart that really gets into the minds of its less-than-perfect characters, with audiences often reporting that the show has made them “really love Mormons”.